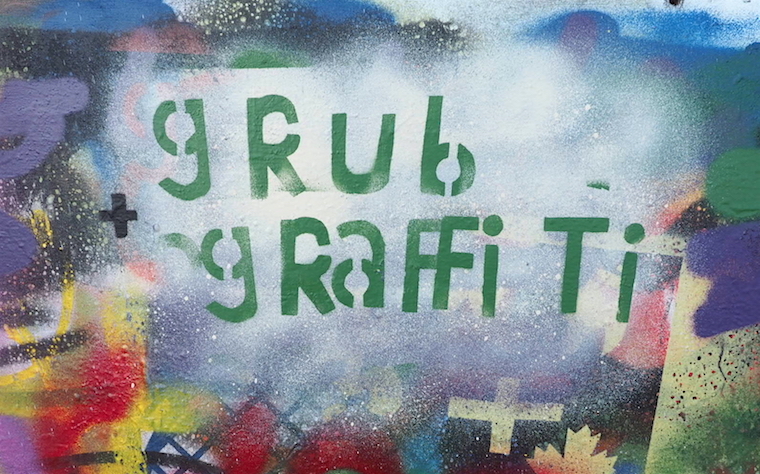 It might have just been the lingering paint fumes talking, but as I got to work designing and stencilling my artwork, I had a sneaking suspicion that I would uncover a hidden talent as a graffiti ninja. Oh well. 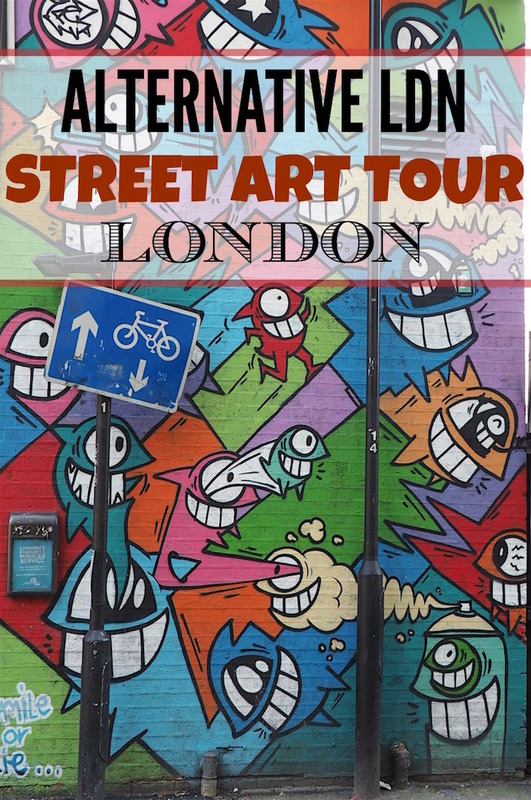 Despite my lack of artistic prowess, the tour that allowed me to try my hand at it – the Alternative LDN Street Art Tour and Graffiti Workshop – was more than enough fun to make up for a few shattered dreams. It all began four hours earlier when we met up with our guide, Josh, in the Old Street area of London on a sunny Sunday in March. 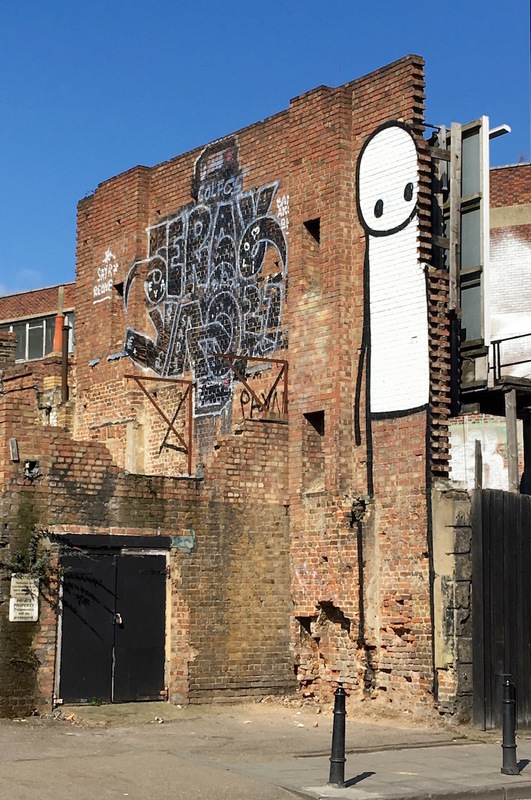 He looked the part, with his Ned Kelly hipster beard and 90s parker, and he was easy to chat to, happy to answer questions and, as a former graffiti artist, clearly knew his stuff. 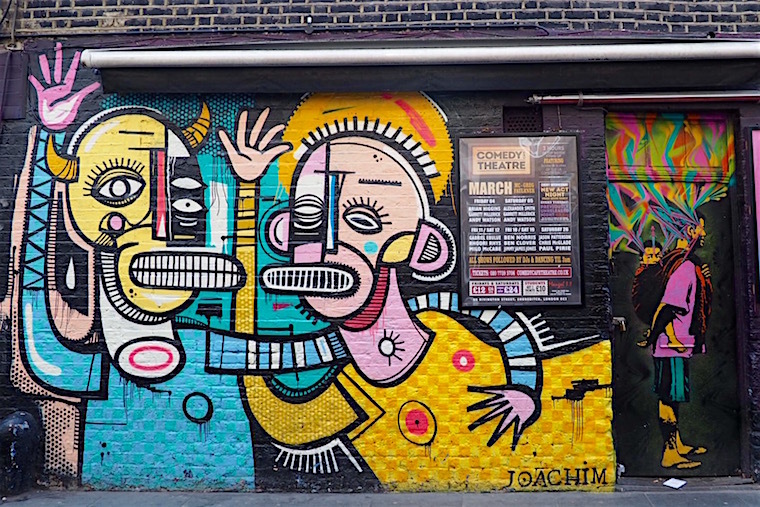 Though Brick Lane would be the obvious choice for an East End street art tour, it’s heaving with market stalls and humans on Sundays. 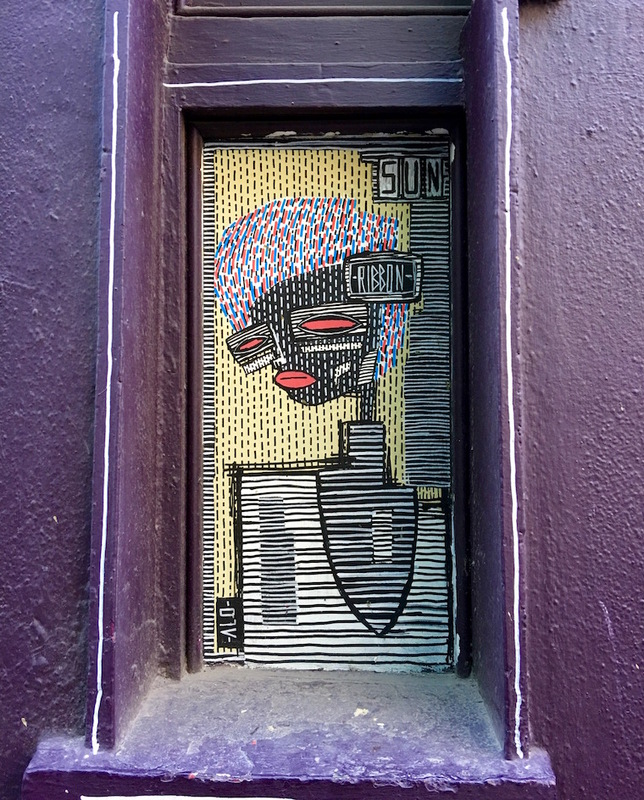 We skipped it in favour of quieter backstreets where Josh could bring to life the world of street artists and point out the murals and tags overlooked by 90% of passersby. 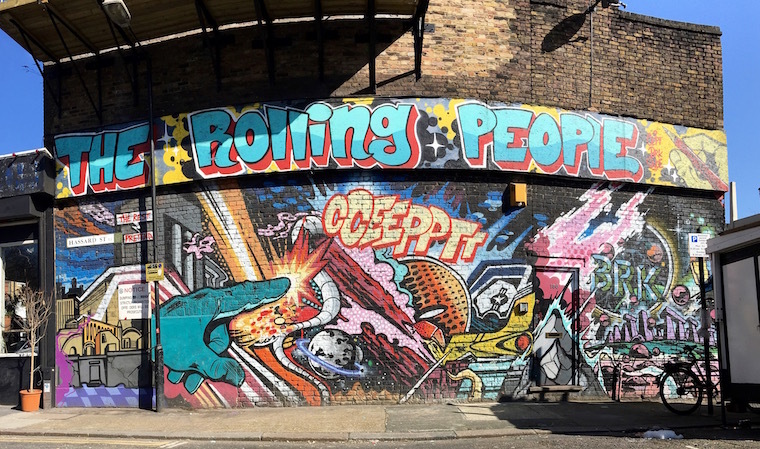 I wasn’t sure exactly what to expect from a street art tour, but I was pleasantly surprised at what we got out of it beyond a look at the artwork from some of the most famous names in the business. 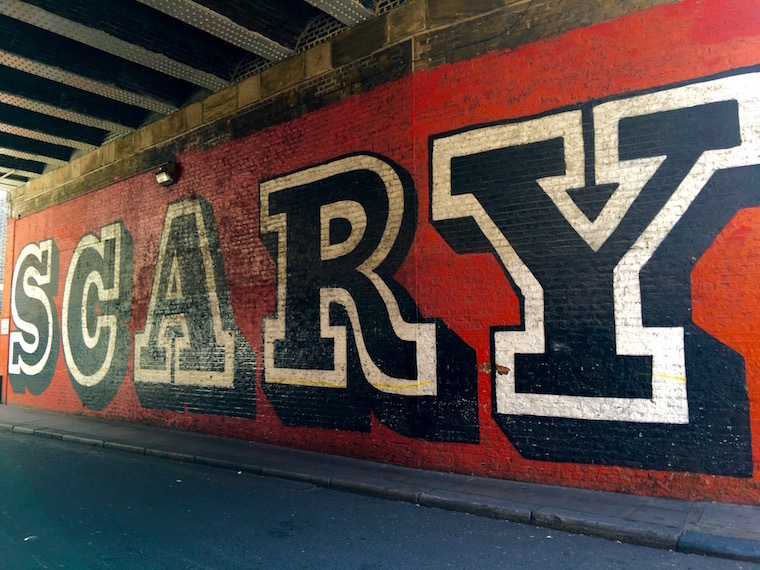 Take Ben Eine, for example, famous for his typographical artwork like the one below. Did you know that he went from making his art illegally – I’m talking dead-of-night, legging it from the cops, actually-getting-arrested illegal – to having one of his pieces presented to Obama by David Cameron? Learning about the prison-shaped dangers of graffiti artistry is probably what stuck with me the most. 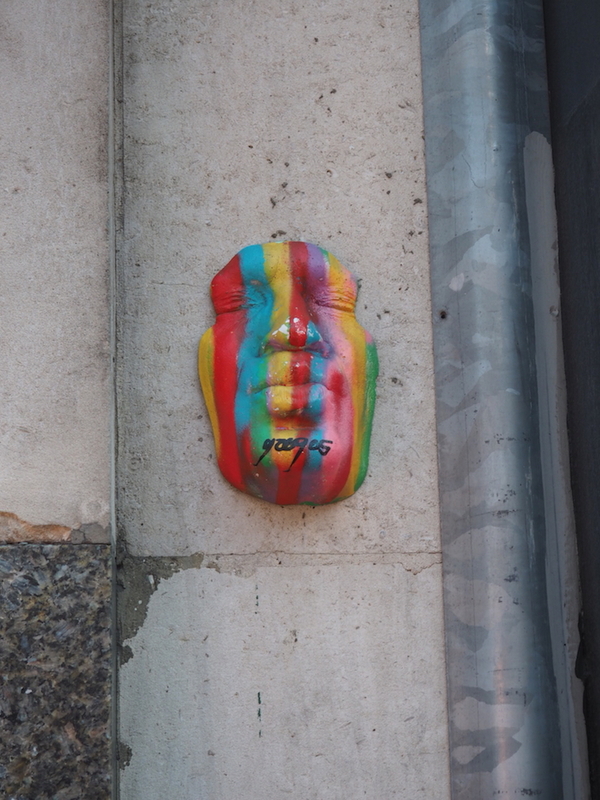 I knew that it’s illegal to spray paint property without permission, but I hadn’t really thought about the consequences – or how these street artists ever make such complex pieces of work when they’re constantly listening out for footsteps and getting ready to run for it. And you don’t just get a rap on the knuckles either if you’re caught in the UK – if you’re over 18 and found guilty, you can be sentenced to up to ten years in prison. TEN YEARS. And that led us to another light-bulb moment on this tour – who decides what’s art (and therefore OK to keep) and what’s vandalism? 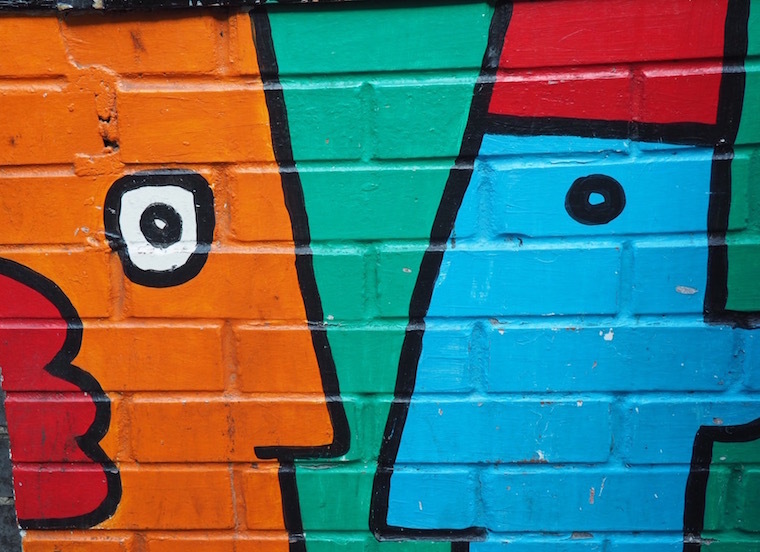 Isn’t it all subjective anyway? 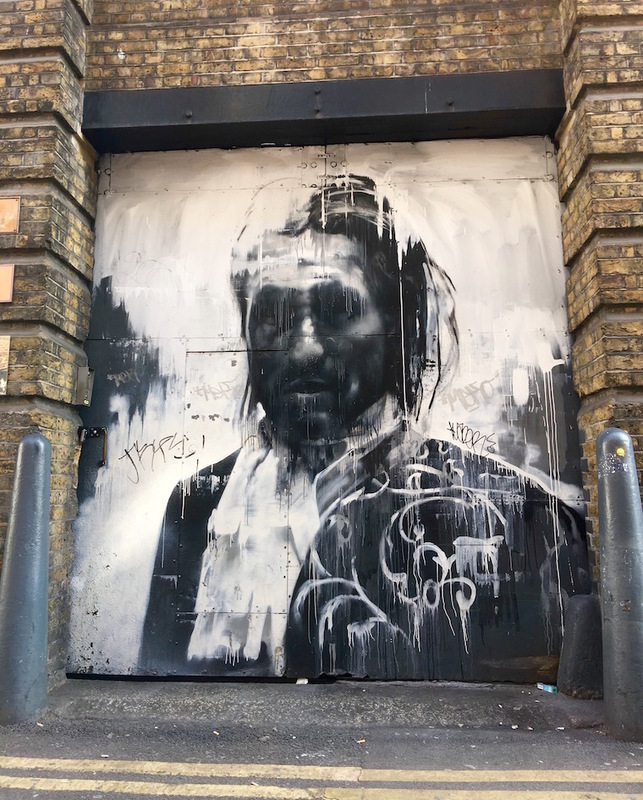 How come Banksys are protected (and even sought after) when a different piece from a less well-known artist might be seen as criminal damage and painted over by the council? And I wonder how it affects the internal politics between graff artists when you cross over from clandestine writing to being legit and commissioned to do artwork. In daylight! With permission! Are they seen as sell-outs, or is it the dream to transition to mainstream? 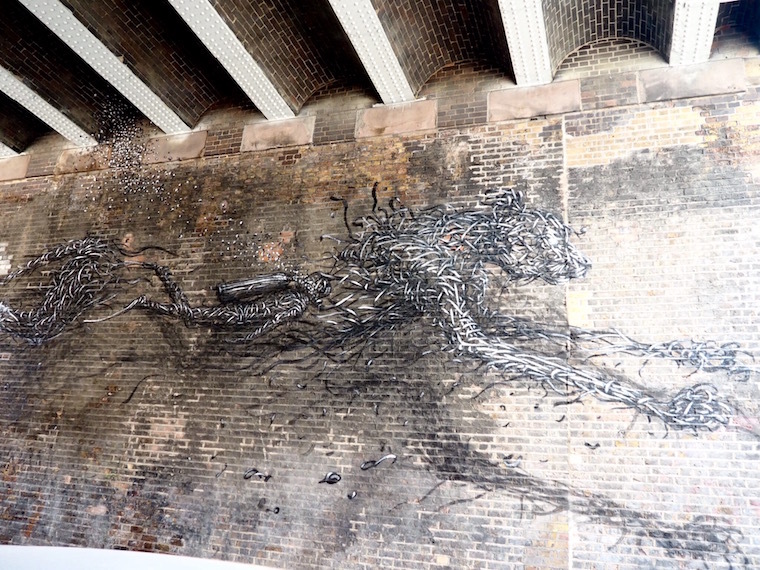 This piece by DALeast was commissioned, I think. I can’t imagine him getting crap for it though, it’s pretty amazing. 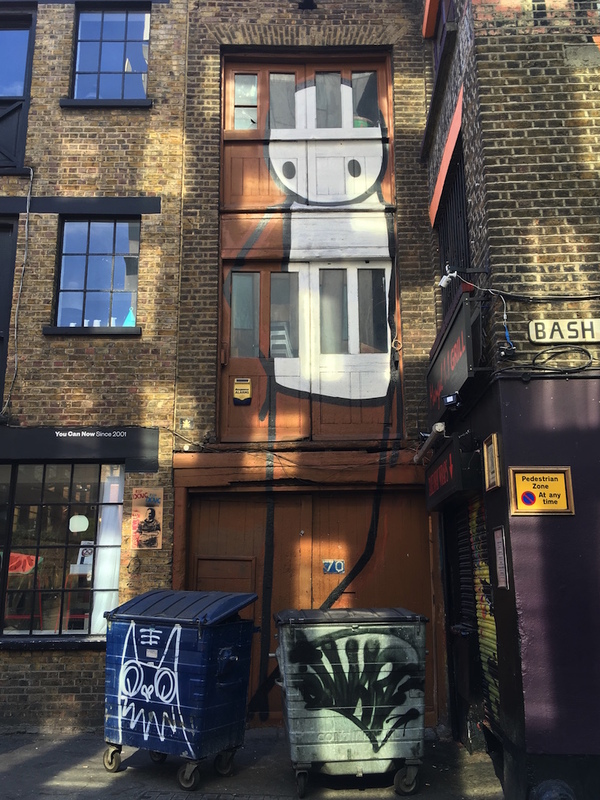 … and see not one, but two works from Stik. I love his stick people, they’re like benign, curious aliens watching over us. 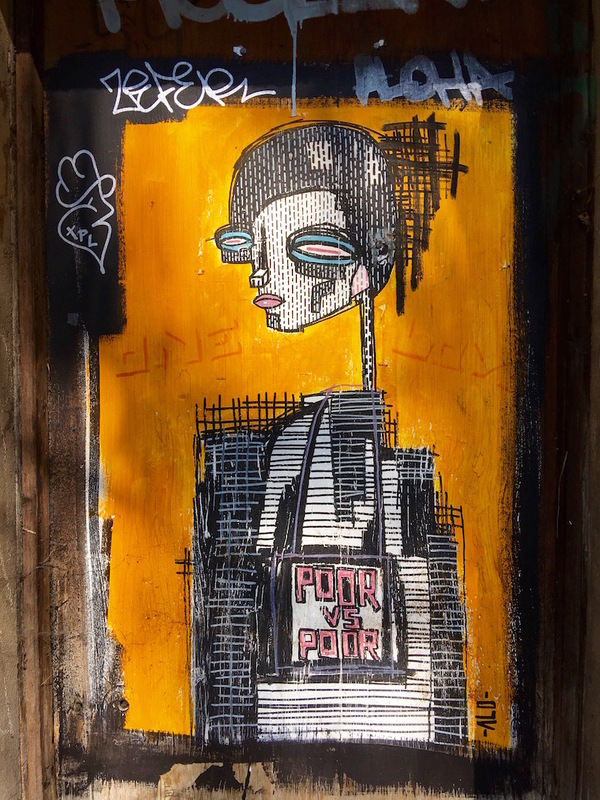 Because he was homeless and living on the margins for a while, his work tends to draw attention to social welfare and community issues – like this one (below), painted in a low-income area where there’s very little affordable housing. That shell of a building is going to be redeveloped into luxury flats. 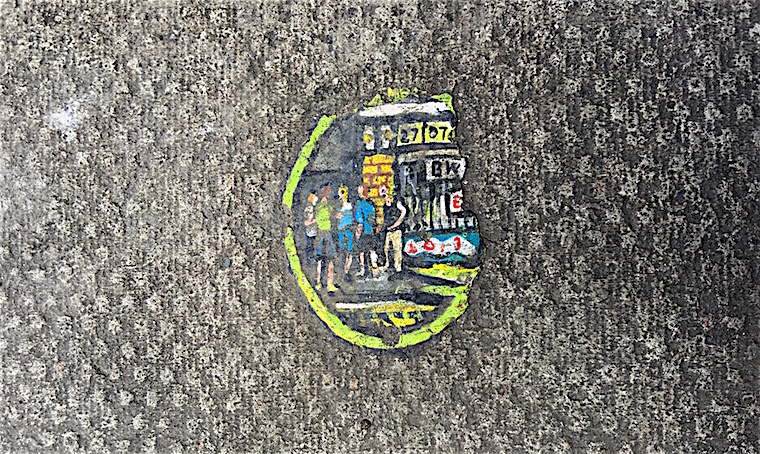 And, as with the Gregos masks, we realised we had to keep our eyes peeled and look for the hidden and overlooked… like this tiny chewing gum masterpiece from Ben Wilson. I’ve zoomed in so it’s clearer, but yes, that’s a flattened blob of chewing gum stuck to the pavement. …and these gorgeous creations from ALO. 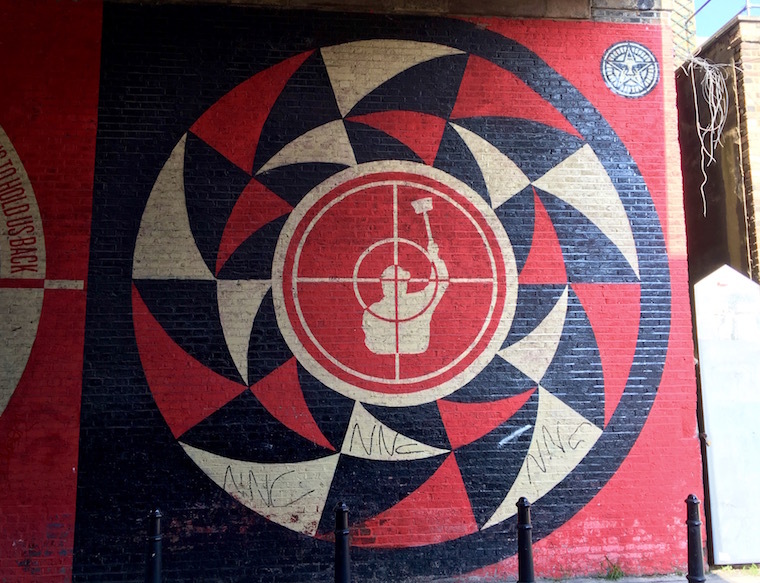 We DID see a Banksy – with glass protection over it – and also these huge murals from Shepard Fairey, another famous artist who now has his own clothing line. By the way, I’m not giving away the whole tour here – this is only a sample and I haven’t even covered half of the stuff we learned from Josh, so there’s definitely more to the experience than you see here. But even after all that schooling, and with all that inspiration on display, I still couldn’t quite channel it into anything like a masterpiece in the graffiti workshop that followed. Or even something that a 5-year-old could be proud of (I may have spelled ‘graffiti’ wrong on my first attempt!). It’s probably for the best though. I’m a horribly slow runner. 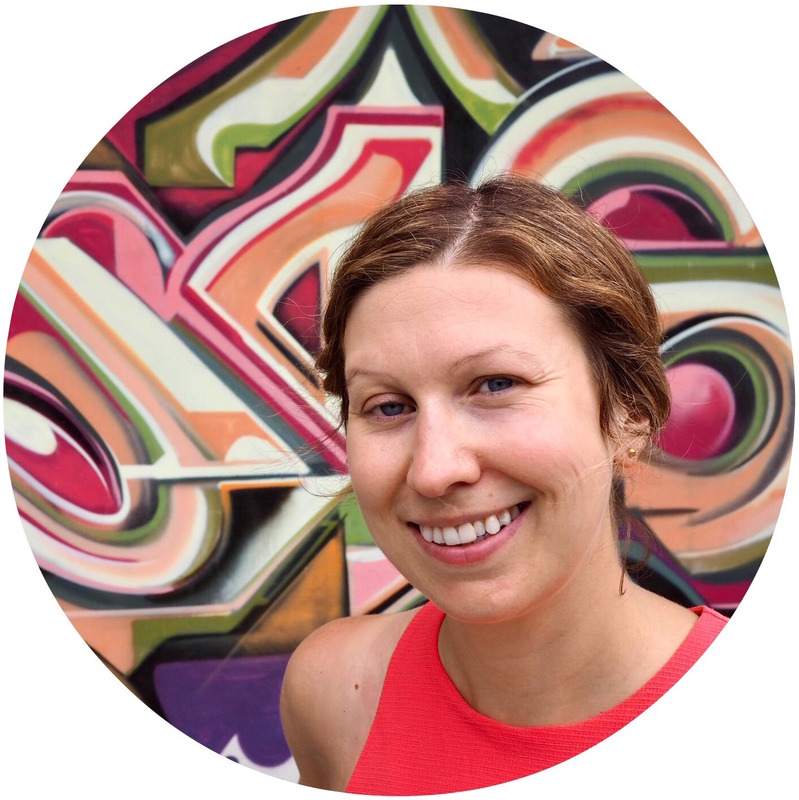 This post is kick-back free – no freebies for Jen.